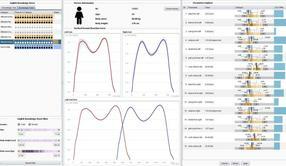 A software tool for gait analysis in physiotherapy, developed in the context of the project. To generate useful knowledge from huge amounts of data, researchers are working on interactive visualisation methods that provide an optimum combination of artificial intelligence and human expertise. In the context of a project funded by the Austrian Science Fund FWF, a research group from the St. Pölten University of Applied Sciences has developed a versatile framework for data visualisation that permits easy integration of expert knowledge. Processing large amounts of data is one of the most important issues of our time and currently the subject of intensive research efforts. While some approaches try to control the flood of data with artificial intelligence methods, others try to organise it in such a way that humans can get to grips with it more easily. A research group headed by the computer scientist Wolfgang Aigner is working on connecting the two approaches and has now developed new methods to present time-dependent data in a comprehensible way and offer simple ways of integrating additional knowledge. Two case studies were carried out as part of the project. “We have applied the new concepts to two examples, first in IT security research, specifically in malware analysis, which is about the search for malicious software parts, and secondly in physiotherapy, specifically in gait analysis,” explains Aigner. The team developed prototypes of computer programmes for this purpose. Aigner explains the system using gait analysis as an illustration: “The patient walks over a pressure-measuring plate. Details in the heel-to-toe contact sequence are measured and the data can lead to conclusions concerning, for example, knee or hip problems.” After recording an entire step cycle, various parameters are deduced on the basis of expert knowledge using statistical methods. The aim is now to be able to add this expert knowledge to the programme in a simple manner in the course of the application. “Let’s say I am a physiotherapist, and I know that a person with a certain combination of parameters has a meniscus problem. In our system, I can highlight the entire measurement series with the mouse and drag and drop it into an area on the screen that I have created for meniscus problems. It contains the measurement data of the people who have the same problem, and I use them to define that knowledge.” Each new data set is automatically compared with the stored datasets, and the programme will signal when it finds similar characteristics. This means that the computer analyses the data, but only up to a certain point, as Aigner explains: “It is important to note that our goal is not to automate the diagnosis completely, but only to provide support.” The diagnosis remains the responsibility of the experts. One of the two prototypes is still in practical use. “In the area of malware analysis, there was already a spin-off project during the course of the FWF project, where the prototype was adapted in co-operation with a corporate partner. They are using the programme for internal purposes.” Follow-up projects are designed to foster the application of the concepts developed and also to add “sonification”, i.e. working with sounds, to visualisation.